This fun, March themed activity will help your students practice recognizing, comparing and ordering numbers 1-30! This is a fun whole group activity, then once introduced can be used as a center/partner game or in small groups. You can use your classroom number line or the one included in this file. 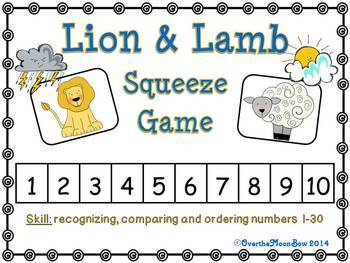 There are even B&W versions so students can make their own Lion & Lamb Squeeze Game! Be sure to check out my other Common Core math resources!